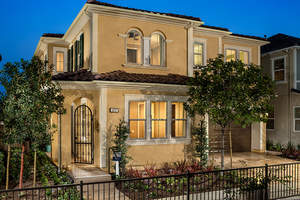 WESTMINSTER, CA--(Marketwired - Apr 7, 2015) - The overwhelming demand for spectacular new homes at The Christopher Collection by Christopher Homes continues to bring impressive sales success, making Westminster's first new home community in more than a decade the area's most sought-after address. To accommodate the incredible demand, Christopher Homes has released a new phase of luxury homes for sale within the private, gated enclave. Comprised of only 80 single-family detached residences, The Christopher Collection appeals to a variety of lifestyles offering three elegant floorplans with voluminous living spaces in a prime location just minutes from Little Saigon Village. Buyers interested in these limited-edition luxury homes are encouraged to act quickly and visit the sales gallery to select their favorite floorplan before this new phase is sold-out. To begin the pre-qualification process, log on to www.thechristophercollection.com and join the interest list. "The tremendous buyer response we've seen from the moment we debuted The Christopher Collection reflects just how extraordinary this new home neighborhood is," said Jaime Todd, Director of Sales and Marketing for Christopher Homes. "With the new release of additional homes, we highly recommend that anyone interested start the pre-qualification process now -- you'll want to move quickly as these homes will continue to sell quickly." The Christopher Collection's stunning two-story designs showcase authentic Spanish, Italian and St. Augustine architectural detailing with three distinctive floorplans. The thoughtfully crafted designs feature spacious open-concept living spaces with 4 bedrooms, including a luxurious master suite; up to 3.5 baths; chef-inspired kitchens with a large island and eating bar; impressive great rooms for entertaining; and two-car attached garages in approximately 2,193 to 2,659 square feet. Adding to the unparalleled appeal are design elements such as California Rooms that seamlessly expand indoor dining and entertainment spaces outdoors, as well as desirable lower-level bedrooms for visiting guests or multi-generational relatives. The Residence Three also features a convenient first-floor office; a versatile bonus room that can be transformed into a children's playroom or study area; and the option of adding double sliding glass doors at the California Room. Every home is enhanced with premier interior appointments including granite slab countertops and high-end stainless steel appliances in the kitchen; desirable energy efficient comforts; and impressive exteriors with the luxury of low maintenance front yard landscaping. An array of customization options ranging from custom flooring to upgraded appliances are also available to buyers to further enhance their home. Prices for these new luxury homes are from the high $700,000s. The Christopher Collection's excellent location creates the perfect atmosphere for families, offering them access to top-rated public schools including Murdy Elementary School, McGarvin Intermediate School and La Quinta High School. For recreational opportunities, residents will find Bowling Green Park and Newcastle Park within walking distance, while the popular cultural center of Little Saigon Village is minutes away with fantastic bistros, bakeries, dining and shopping options. The I-405 freeway and CA-22 are also nearby, easing the burden of longer commutes. To visit The Christopher Collection's models and sales office, exit the I-405 freeway at Brookhurst Street and travel north. Continue past Bolsa Avenue then turn left onto Harmony Lane and follow signs to the model homes. The sales office is open Monday from 1 p.m. to 6 p.m. and Tuesday to Sunday from 10 a.m. to 6 p.m. Those interested are also encouraged to follow Christopher Homes on Facebook and Instagram. Visit www.christopher-homes.com for more information. The Christopher Collection offers three distinctive home designs ranging from approximately 2,193 to 2,659 square feet with 4 bedrooms and up to 3.5 baths.